"It was a miasma of confusion." If I told you that this was a doc about the Kennedy assassination directed by a man named Stone�and that if featured a few behind-the-scenes moments from the conspiracy-heavy feature film JFK�your logical mind might assume the first name might be Oliver, or at the very least a relation. Robert Stone�director of the chilling doc Radio Bikini�isn't part of that Stone family tree, but with Oswald's Ghost (part of the PBS series American Experience), he manages to go over the now familiar chain of events in a rather compelling and engaging manner, offering yet another capsule summary of one of the great whodunit mysteries in U.S. history. Stone uses a number of interview subjects (including Norman Mailer, Dan Rather, and Gary Hart) to move the narrative along, augmented by appropriate and relevant archival footage, some of which hasn't been seen before. As a primer for those with no real knowledge of the subject, Oswald's Ghost will likely seem effective, though anyone who's dug deeper will know that practically every aspect of this vast, swirling case leads to even more weirdness. With just under 90 minutes to work with, Stone has to keep his approach on track, so there isn't a lot of time to veer off onto deeper, stranger (perhaps more conspiratorial) tangents. The subject here, as the title would indicate, is Lee Harvey Oswald, so even as Stone touches on the role of Castro, the mob, or rogue elements of the CIA as potential assassins, the crux of the doc is the enigmatic loner in book depository. There is some barely polite back-and-forth between a couple of authors with vastly different opinions, but overall the tone here isn't necessarily "was it him or wasn't it." Instead, Stone connects the interviews into a larger canvas that tries to show just how Oswald fit into it all, using extensive footage of New Orleans district attorney Jim Garrison to draw in the beginning of what would eventually become a confusing yet equally fascinating conspiracy angle. I've read a number of Kennedy assassination books, viewed a multitude of documentaries, and despite my personal leanings, I've made of point of looking at the subject from all viewpoints (no matter how crazy they sound). Despite the grand tragedy of the murder of a U.S. president, the whole thing over time now seems like a manufactured mystery game, full of bizarre characters, strange coincidences, and a wealth of unanswered questions. Stone obviously doesn't have the final answer here, but the presentation is intelligent and well done, and Oswald's Ghost provides yet another opportunity to review the basic facts. Or to hear them for the first time. Image Transfer Review: Don't let the 4:3 menu startle you, because Stone's doc is presented in 1.78:1 anamorphic widescreen. As expected, the archival material shows its age, but the interview segments carry natural fleshtones and well-defined details, aside from some light grain. The new exterior shots of Dealey Plaza have vivid colors, with the sky and grass appearing especially bold. Audio Transfer Review: Two audio choices available here, in either Dolby Digital 5.1 or 2.0 stereo. Oddly enough the 2.0 is the default, though switching over to 5.1 doesn't initially reveal any grand differences early on. There's not much in the way of rear channel activity; however, the score gets dressed up nicely, sporting surprisingly deep bass. Otherwise, voice quality is clear, even for some of the older archival bits. Extras Review: Two of the three extras (all in anamorphic widescreen) run about half hour in total, and appear to be additional footage that Stone didn't use in the final cut. A Visit to Dealey Plaza (09m:34s) highlights a couple of conspiracy-types who make a living hawking theories to tourists, while The Zapruder Film And Beyond (22m:12s) expands upon what's already in the film, utilizing some of the same interview snippets with the likes of Josiah Thompson and Norman Mailer. Interview With Robert Stone (15m:47s) has the director giving his take on the fascination with the subject, his search through archival footage, and even his own personal opinion on who shot President Kennedy. The disc is cut into 13 chapters, and does not carry any subtitle options. If you're a student of the Kennedy assassination, there likely won't be any new news here for you, though director Robert Stone does dig up some rarely (if ever) seen footage to help sell another retelling of the story. 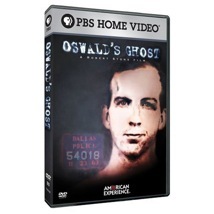 This is still a fascinating watch, as Oswald's Ghost neatly paints an overview that allows viewers to make up their own minds.